We would like to express our sincere appreciation to you for your continued support. The Japanese economy is expected to continue its moderate recovery in 2019. However, the outlook for the economy is predicted to remain obscure due to factors such as trends in trade issues and the effects uncertainties about overseas economies may cause. 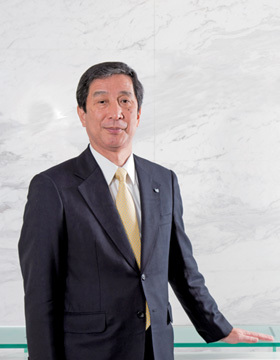 In January 2018, for the purpose of offering values that are in line with real needs of customers more than ever before, the Canon Marketing Japan Group changed its organizational structure from the previous product-oriented structure to a new one in which customers are positioned at the starting point. Under this new structure, the Canon Marketing Japan Group aims to become a group of vibrant, high-revenue generating companies with the maintenance of income from major products of Canon, the realization of increases in both sales and income in the market expansion areas, particularly IT solutions, and the establishment of the revenue base in Canon’s business whose growth is expected, as basic strategies adopted in the Three-Year Management Plan for 2019-2021 whose implementation began this fiscal year. Canon’s major products, such as digital cameras and ink jet printers, were able to maintain their top market shares in the previous fiscal year. Their markets are shrinking, but Canon Marketing Japan will maintain high market shares and profitability by bolstering its product lineup and raising unit selling prices. Moreover, Canon Marketing Japan will strengthen its IT solutions business, which is positioned as a growth pillar. For leading companies, the Company will strengthen digital business fields with customers by applying the in-depth knowledge of business categories and operations in its possession. For second-tier, small and medium enterprises, the Company will transform itself into an IT partner offering optimum values to such customers throughout Japan as their IT concierge. By proposing total security solutions that support such initiatives, providing high value-added IT infrastructure services that leverage data centers and BPO services specializing in operations among other services, the Company will also expand businesses that solve problems and offer services from customer perspectives. We will secure stable growth by pursuing new revenue models centered on IT solutions technologies and steadily achieving the targets set in our plans while maintaining our traditional revenue models such as maintenance services and cartridges that relate to hardware. We respectfully request the continued support of our shareholders and investors.